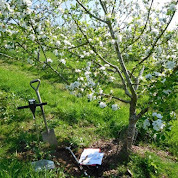 Over the last twelve years we have planted 1000 apple and pear trees. We have selected old traditional varieties such as Ashmead Kernel, Taynton Codlin, Annie Elizabeth, Worcester Permain, Yellow Ingestrie, Lord Lambourne, Howgate Wonder and Egremont Russet. Others are more modern varieties suitable for organic orchards such as Saturn, Cevaal and Rajka. We aim for minimum intervention from tree to table. Most commercial orchards are managed in order to produce blemish free fruit for the table. The trees are grown in permanent pasture. This helps to build carbon levels in the soil, and aids long term fertility. Apples are picked by hand.